Channel Men's Shed Margate Tasmania. Channel Men’s Shed is located at 24 Van Morey Road, Margate Tasmania. 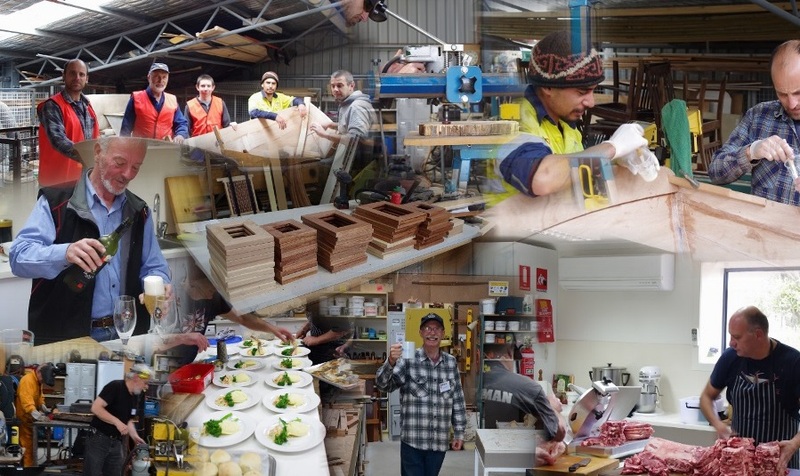 The Channel Men’s Shed provides a friendly and safe working environment where you can enjoy fellowship with other like-minded men. An variety of activities are catered for including: woodwork, metalwork, handyman’s library, jewellery making, cooking classes or pretty much anything you are interested in doing. You can even utilise your skills by introducing a new field of interest or activity for other members. There is a computer room, an excellent lounge area with large screen TV and stereo where you can make yourself comfortable, just sit around and chat or watch sport, listen to music etc. The Shed also has a fully equipped kitchen where you can cook, learn to cook or teach other members to cook. Members are welcome to attend the Shed’s monthly Committee meetings – a timetable is available here. Call in and learn more about what Channel Men’s Shed can offer you. The Shed is open weekday mornings, excluding public holidays, from around 9.00AM until about noon. Most of our members have found this sufficient for their needs and our volunteer coordinators leave when the last member departs. Other arrangements may be possible and interested members should contact the Shed by telephone during operating hours or email, contact details here. You can learn more about sheds in Tasmania by clicking on this link to the Tasmanian Men’s Shed Association Inc.